The manual pole saw is a versatile and practical tool for trimming or cutting branches. This power tool is known under various names, such as pole pruners or tree pruners. In this review, we'll use those terms interchangeably. The main benefit of the manual pole saw is its ability to provide a lot of control over your trimming process. This power tool is ideal only when you have a small amount of trimming, edging or cutting to perform. If you are looking for a manual pole pruner, our pole pruner review below should help you find some of the best manual pole saws available on the market today. You can also read other product reviews such as pole saw, Sun Joe SWJ800E pole saw, Remington RM1025SPS electric pole saw, Greenwork pole saw, Black & Decker LPP120 pole saw, gas pole saw, pruning saw. The Fiskars 7.9-12 is one of the best tree pruners and most popular model available on the market today.It is a simple looking manual pole saw that by default comes with a scissor tip. However, you also get a 15-inch WoodZig saw blade full cutting branches with this purchase. The pole measures a decent 7.9 feet and can be extended to a maximum of 12 feet for more versatility. This model is ideal for cutting branches of no more than 1-1/4 inches in diameter when fitted with the factory default scissor tip. Additionally, this model does not use ropes which can get tangled with branches and leaves when trying to reach a high and hard position. Further, activating scissor tip is incredibly easy with the Fiskars 7.9-12 with a simple clockwise twist action. You hold the bottom of the manual pole saw with one hand and the upper handle with the other and perform a twisting action. Very easy and can be used even by absolute beginners. The Fiskars 7.9-12 is one of the best manual pole saws on the market. It is relatively affordable and gets the job done as long as it is not used for heavy duty purposes. We recommend this model for those trimming small trees, bushes and cutting small branches of no more than 5-inch in diameter. The Silky 179-39 is one of the longest manual pole saw in this pole pruner review. It measures an impressive 21 feet when all 3 parts of this pruner are assembled. When you take into account the included Silky 4-RETSUME 15-2/5 inches sickle blade, it has an impressive work area of 26 feet. That is very long! Moreover, this is a 4-section pole saw, when you take into account the handle - which is coated with a soft rubber material for more comfort. The unit is factory fitted with a Silky 4-RETSUME sickle blade that is mostly useful for vine pruning or fine trimming due to the 4 rows of blades. However, it can be fitted with other attachments (purchased separately) that can make it even more versatile. Additionally, it has a lightweight of 6.9 lbs, making it easy to hold and operate. It can be maneuvered into tall and tight areas fairly easily, and due to this lightweight, you can now work longer periods with less hand fatigue when compared other manual pole saws. Due to the long size and telescopic nature of this pole saw, it has a wide range of applications like forestry work, trimming, or vine pruning - given that you fit it with the proper attachments. If you need a very long pole for cutting thin branches of less than 1/2 inch, this is one of the best pole pruners in the industry. It is very long, allowing you to reach high-up places, and comes with a Silky 4-RETSUME 4-row blade that is excellent for vine pruning, branch trimming, and cutting. It is not the best for edging work unless you fit a scissor-type attachment to it (additional purchase required). The Gilmour 20-18 is a cheaper solution for branch cutting and trimming work. It has a long 16-inch curved saw blade attachment that is also non-stick. This is very important, especially when cutting branches that have sap and resin. It prevents it from sticking and is more efficient in cutting. It comes in a 3 octagonal poles design that can be fitted to one another, for a maximum of 18 feet of reach. This is not the tallest manual pole saw, but it will be sufficient for most garden trimming and pruning work. Additionally, the back is fitted with a branch hook that allows you to easy hook and breaks tender branches. You generally use this hook to pull down stuck branches. Very practical if you have a lot of twigs to trim - more time-saving that cutting them one at a time. The Gilmour 20-18’s handle is made from a solid fiberglass construction, that makes it lightweight, comfortable, and durable at the same time. The pole bar, blade, and hook are made from cast-aluminum, for even more durability and long-life. Since the blade is resistant to sap, we recommend this long pole to those who need trimming or pruning trees that normally create sap or resin when cut. Additionally, you can use this pole saw on a regular tree for branch trimming as long as the reach is not more than 18 feet. The Fiskars is another affordable manual pole saw. It is not the tallest pole saw we have seen, as it has a maximum reach of only 14 feet. However, it is still overkilled when it comes to trimming bushes and small trees. As with most Fiskars pole saws, it comes factory-equipped with the traditional 15-inch WoodZig saw blade known to be one of the best manual pole saw blades on the market. This blade is normally a pruner blade that works best when used on branches that are 1-1/8-inch in diameter or less. Again, Fiskars over-delivered on build construction with a pole made almost entirely of fiberglass - which is durable and lightweight. As for the 15-inch blade, it is made from hardened steel for a long lifetime and heavy-duty trim work. Additionally, the blade is coated with a low-friction paint making it easier to glide amongst branches and leaves, especially on trees that produce a sticky sap. Lastly, the length can quickly and easily be adjusted with the help of the one-thumb release lock mechanism that makes working with this unit a really treat. We like the ease of use, build quality and convenience of this manual pole saw. If you need to trim leaves and branches on fairly short trees that produce sap, the Fiskars 14 Foot is one of the best tree pruners there is as the low-friction blade easily glides amongst the leaves and branches. The ARS LA-180ZR203 is one of the most straightforward pole pruners there is. It is a simple and yet highly efficient pole that can be used to trim branches of less than 1-1/2-inch quite easily. This model has a single lever to activate the forged aluminum scissor blade. This system is the easiest and most simple to use. Best, you do not need any experience to operate this pole saw. It has a telescopic pole, that can be retracted or extended to a minimum of 4 feet and a maximum of 7 feet. Additionally, this is a very lightweight pole saw - in fact, one of the lightest in this p﻿o﻿le saw review at only 2.2 lbs. Therefore, it is very maneuverable, and you do not need to have a lot of muscle power to operate this model. The handles are also ergonomic and coated with a rubber material for better handling comfort. Finally, the swing neck can be adjusted on the fly from 0 - 30 degrees. Sometimes you will need this angle versatility to cut hard to reach or awkwardly positioned branches. Very handy! We recommend the ARS LA-180ZR203 for pruning small bushes and branches with a reach of no more than 7 feet tall. Silky 272-18 is a telescopic pole saw that can extend to a maximum of 13 feet with a minimum of 7.7 feet. It is a 2-part pole that can quickly and easily be retracted using a click-and-lock mechanism. It comes with a factory fitted 13-inch impulse-hardened blade containing 6.5 teeth per inch. Silky calls this the “Silky MIRAI-ME” blade technology. It is packed enough for fine tree pruning and can cut through small branches. The teeth on this blade are angled at 4 different ways, making it very easy and efficient when cutting tough branches. It can even be used to cut nodes or knots. The blade is solidly-fitted to the pole, and it will not bend or twist under pressure. What really sets this pole saw apart is efficiency. Silky made sure that the handle communicates with the blade via a pin/lock system that is able to transmit near 100% force from the handle to the blade. This means that you can do more cutting this pole saw with less force. Additionally, the unit weighs only 3.8 lbs which mean that it is lightweight and maneuverable. Further, the handle is coated with a rubber material making it very comfortable to hold. You can use this pole saw for hours without hand fatigue. For those looking for a basic and yet efficient small pole saw, the Silky 272-18 is one of the best tree pruners on the market. Due to its efficient pin/lock system, it does a great job cutting branches, including nodes with minimum effort. Lastly, we have the Landscaper Pole Saw. This is a 3-series of 6 feet poles that when attached together provide an effective reach of 18 feet. The extensions have a ferrule mechanism that solidly holds the parts in place. Further, the all 3 pole parts are made from hollow fiberglass that is tough and durable. At the end of the head, we have a sturdy 16-inch Tri-Cut saw with rows of teeth angled in a way to provide maximum cutting efficiency. This blade can be used to use branches of 16-inch or less. Additionally, it is tough enough to cut logs or lumber of 32-inch in diameter. Quite impressive! We also like the presence of a branch hook at the back of the blade. This makes it easier to bring down cut branches. All in all, it is a simply manual pole saw with an efficient blade that gets the job done. Due to the lack of a comfortable handle, we can only recommend this manual pole saw for small amount of trimming tasks on a tree of no more than 18 feet in height. While the large 16-inch blade has an efficient design for cutting large logs and branches, it can get quite uncomfortable when used for longer periods. As with anything, there are certainly important criteria as to take into account before purchasing a manual pole saw. The pole length is one of the most important criteria since it decides on your maximum reach. The bigger the reach, the more easily you will be able to access branches high up on the tree. For the best maneuverability, ensure that your manual pole pruner is also lightweight. It will be easier on the hand and cause less hand fatigue over time. The manual pole saw is known for its ease of use and versatility. Indeed, you can attach a lot of accessories to a pole saw and totally change its function. For example, you can use a scissor tip for pruning, or a blade saw for cutting thick branches. Before purchasing a model, ensure that it can accommodate various accessories for more versatility. The durability and strength of the pole bar are crucial. When cutting branches, you do not want the pole bar to bench, or worse, to break under heavy load. It needs to be made from a durable and quality material. Most reputable pole saw brands ensure that you always get the most solidly constructed pole saw for your money. Therefore, it is important to always go with a good brand rather than a generic pole saw model. It has been quite a journey. As we have seen, the best tree pruner is not necessarily the most expensive. In fact, you can get a fairly decent model at an affordable price. 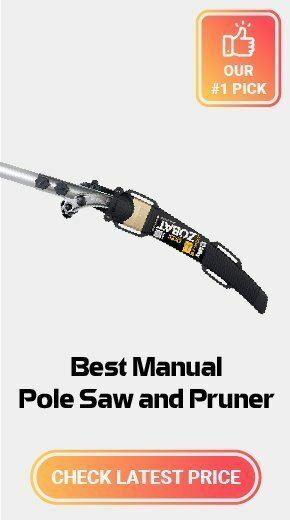 If you have still not found the best pole pruner for your need, we recommend that you go through this manual pole review one more time. In any case, all the models listed in this review are value for money and should perform exceptionally well as long as they are used with the appropriate pole attachments.